North Korea’s ambassador to the UK has said his country is “not afraid” to continue its missile and nuclear weapons activity, and that Pyongyang intends to conduct its sixth nuclear test as soon as the leadership deems it necessary. Choe Il said that United Nations sanctions, international calls for denuclearization and the US’ aggressive posturing won’t deter the North from persisting with its nuclear and ballistic missile program, telling Sky News, "In regards to the sixth nuclear test, I do not know the scheduled time for it, as I am here in the UK, not in my home country … However, I can say that the nuclear test will be conducted at the place and time as decided by our supreme leader, Kim Jong-un." In his first televised interview as ambassador, Choe said that the Democratic People’s Republic of Korea (DPRK) was unmoved by US President Trump’s threats of military action, stating that, "If we were afraid of it, we probably would not have started conducting nuclear tests or launching ballistic missiles." "We are developing our nuclear strength to respond to that kind of attack by the US. If the US attacks us, our military and people are fully ready to respond to any kind of attack." As a US Navy carrier strike group led by the USS Carl Vinson sits near the Korean Peninsula, accompanied by the nuclear-powered tomahawk-missile-equipped USS Michigan submarine, Choe said Pyongyang would reduce Washington’s defenses "to ashes" if the US dared to launch a preemptive strike. He said, "The US cannot attack us first … If the US moves an inch, then we are ready to turn to ashes any available strategic assets of the US." 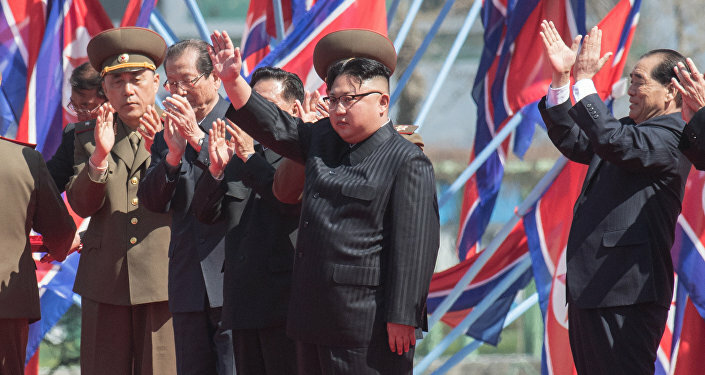 Choe affirmed the DPRK’s right to develop nuclear power as a sovereign nation, suggesting that this activity is necessary given Washington’s hostile behavior. The US vessels are taking part in annual military exercises with South Korea, a set of drills that the North views as practice for invading their country. The South’s newly elected President Moon Jae-in, considered more liberal than his predecessor, the ousted Park Geun-hye, has said he wants to bring "integration, unity and harmony" to the country, even expressing willingness to visit the North and other players in the conflict if it helps facilitate peace. During his Wednesday oath-taking ceremony, Moon remarked, "I am willing to go anywhere for the peace of the Korean Peninsula … If needed, I will fly immediately to Washington. I will go to Beijing and I will go to Tokyo. If the conditions shape up, I will go to Pyongyang." The president also said he would "sincerely negotiate" with Washington over the controversial deployment of the Terminal High Altitude Area Defense system (THAAD) on South Korean soil.